Winding up for the start against Bertrand Pace's Aleph Sailing Team. 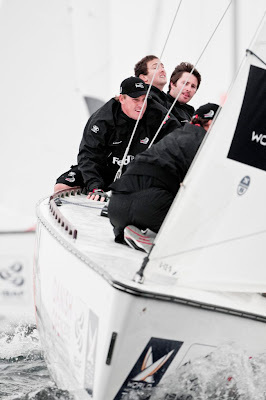 Image copyright Loris von Siebenthal/WMRT. We were involved in 5 matches today managing to win 4, including a very important and exciting win over the current World Tour Leader Mathieu Richard. Our victories today mean that we are definitely well on track to making the semi finals, however we still face a huge challenge ahead of us with three of the toughest races remaining of which we need to win at least two. Although not as blustery as yesterday, conditions still built throughout the day and for our most important match of the day against Mathieu Richard, the breeze was gusting 25 knots. We still had the big overlapping number one genoas on, which made for some very powerful upwind sailing with surfing conditions downwind. The pre-start saw us gain a massive advantage with Mathieu copping a penalty after losing control in the dialup and sailing into the obstruction zone, while we then forced a second penalty on him when he tacked too close to us off the start-line. Despite our great start and them having to take an immediate penalty they still managed to keep close enough to attack on the first downwind. While approaching the bottom mark they did a nice job of gybing onto our breeze and managed to roll over us. We continued to luff past the bottom mark to defend our lead, but the umpires deemed they had broken the overlap and thus we could not continuing to luff them, so we were handed a penalty and it was all square again. A fierce tacking duel ensued up the next beat and we dug in deep to defend our lead, which we held all the way to the finish to take what we are hoping will be a very important victory. Our other victories today came against Betrand Pace, local hope Mads Ebler and the wild card all woman crewed team skippered by Susanne Ward. Tomorrow we face Torvar Mirsky, Ben Ainslie and Bjorn Hansen in our three remaining round robin matches, with the unenviable task of winning at least two of these. There are still 6 teams in contention for the 3 remaining semi final berths, while Francesco Bruni sealed his fate today winning 8 of his 11 races to be the only team so far to qualify. Approaching the top mark. 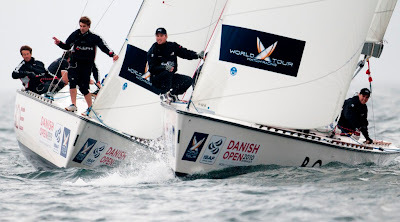 Image copyright Loris von Siebenthal/WMRT.